fairkom is providing cloud services to members and promoters of the FairCoop community. Get a Single-Sign-On account here (provide your normal e-mail account when asked). In case you want to edit FairCoop files in nexctcloud, please ask to be put it in the fair.coop group here. free e-mail account with your domain Due to the re-engineering of the login system, we are currently not issuing new e-mail accounts for GroupOffice automatically. If there is an urgent need please submit an issue here. Please use the gitlab issue tracker to provide feedback on fairlogin services or if you would like to add a service or need a special login (with e-mail or in faircoop group) or if you want to federate your ID server. See also fairapps.net for a complete list of services available by fairkom. fair.coop is an open collective for equality, ecology and a fair economy, strongly committed to use open source technology. Translations, graphical design, software development or testing? If you really want to lend a hand and help the FairCoop ecosystem growing, do not hesitate to browse our to do list. 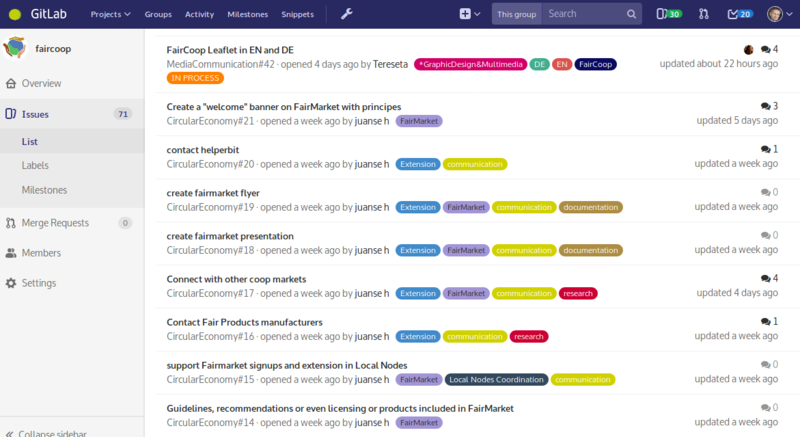 We are managing open tasks with gitlab and remunerate your effort with up to € 10.- per hour (or its FairCoin equivalent) in FreedomCoop's Open Cooperative Platform. Get in touch with us in the Open Coop Work chat group. If you are a software developer, you may also have a look at the FairCoin group at github (Python, C++, Java) or join the OCP team (Django, Python).